Former President “George W” attended the recent memorial services for the 5 Dallas police officers that were killed in ambush during the Black Lives Matter protest last week. 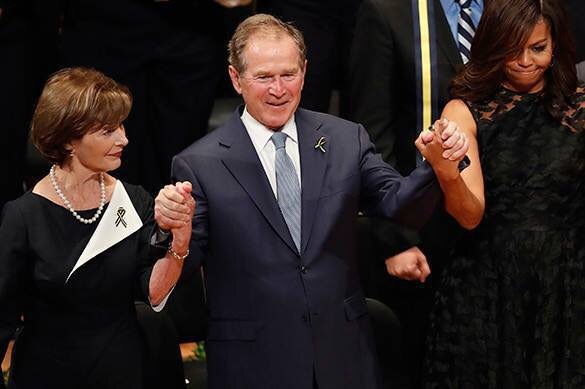 Clearly George “DUB-YUH” was “feeling good” because during the service he breaks out into full stanky leg mode & starts dancing and swaying to the old American classic hymn, “Battle Hymn of the Republic” as a horrified Michelle Obama & Laura Bush look on. You can tell by his wife’s facial expressions that this probably wasn’t his first time acting a fool in public. He definitely appeared to be in “good spirits” aka DRUNK or high on something. President Obama keeps his normal cool but I’m positive that he and Michelle died of laughter later that night.